Ucraft is a website builder meant to create business websites and landing pages both for newbies and advanced users. Their official website is a perfect demonstration of how the system’s features and tools can be put to use, because it is also developed with Ucraft. The platform allows creating responsive websites with popular flat design and full-screen blocks. You can use the system to create websites for free, but there are certain restrictions in this case. A 14-day trial period will let you explore all the features of the system in detail and help you make a decision whether Ucraft is worth its money or not. The interface of the website builder looks welcoming and simple. The websites powered with Ucraft look nice, and it’s quite easy to create one on your own. Let’s look under the system’s hood now and see what Ucraft brings to the table. Ucraft registration is the simplest of all I have ever seen before – you just can use your social media account to sign up for the platform. Another option is to attach an account to your email address. Once signed up, everything goes according to the common scenario: you will be offered to choose a template and then taken to the dashboard, which is very simple and easy-to-use as well. You will get a hang of it in less than 10 minutes. Even if you have zero website building experience you will master Ucraft quickly. All the features are subdivided into categories here, the purpose of which can be easily figured out from the titles. The interface looks stylish and modern, it will appeal to the majority of users. The control panel of the website builder is quite simple – all the setting are nested under 3 sections: dashboard, blocks and elements. 1. Dashboard is a large section with versatile tools. It’s a control center of your website. Here you can change everything, starting from your site page stucture, to changing website template. 2. Blocks is a section that involves a set of blocks with ready-made designs to solve specific tasks. These include a header, footer, feedback form, gallery, contact details etc. By dragging an element to a desired place, you can fill out the pages with these blocks, adjust them to your liking, and to get the website almost ready for the launch. 3. Elements is a collection of widgets that serve multiple purposes. They include posts or post categories, Soundcloud, image slider, text, countdown timer, image gallery, webpage menu, map, video, icon, separator, and more. This set of tools and features will be more than enough to create a business website or a landing page that comply to the standard of modern web design and necessary functionality. Ucraft has its own eCommerce engine. It’s simple in use as the whole website builder. The eCommerce Dashboard looks like a wizard that guides you through the whole process of building your store. Add a product in one click – just point ‘Catalog’ – ‘Products’ – ‘Add New Product’, than fill in all the fields, upload an image and your product is ready to be sold. You can also create discount coupons or apply discount campaigns to selected products. You can connect your Ucraft store with 8 sales channels to sell your goods as much as wide: from Facebook to eBay. Variety of payment and delivery methods allows to adjust them according to the country of your or your customer residence. So why give yourself a hard time? If you need a reliable and functional website builder to create a business website or a landing page, Ucraft is pretty much a perfect choice suiting all intents and purposes. Do you need a killer logo that will boost customer attention? With Ucraft Logo Maker, creating a unique website logo out of simple icons won’t be a problem. It is also possible to upload your own logo, if you have the one already and plan to use it for your website. To give your logo personalized look, you can experiment with colors, fonts, sizes, titles, shapes and other design parameters. Using Logo Maker is free for everyone and it doesn’t take it long to complete the task online. Just follow the step-by-step instructions available at the website and watch the way your emblem is being created! A well-designed and appealing logo will help you establish your business identity, making it recognizable among the competitors and clients. This is the surefire way to make a distinct statement so that your current and potential customers could distinguish your company both online and offline. Having created a logo, you can further export it to use the emblem both in printed and digital formats. With Ucraft Logo Maker, you can express your creativity to get the inspiring and recognizable emblem that will give your website personal touch. 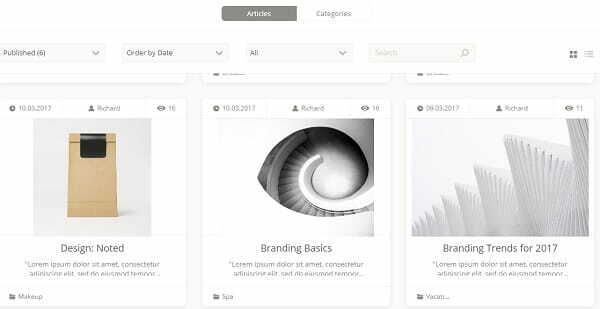 Creative bloggers, who intend to launch and manage full-featured and visually-appealing blogs, will certainly appreciate an opportunity to use the Articles App offered by Ucraft. The application allows creating a blog or publishing a news section on a website to attract user attention. The entire process doesn’t take it longer than several minutes and is generally completed in a few easy steps. By using the application, you will be able to create a blog page layout for as many posts as you need. Go ahead to connect social media buttons to each post to enable users to share the articles with subscribers. Do not forget to optimize the newly created blog by filling out the meta tags. This is the best way to boost your blog search engine ranking. Adjust the system of comments by adding the Disqus commenting add-on. Finally, make use of the WYSIWYG Ucraft Text Editor to make content editing simpler and more flexible. If you cope with the task on a high level, you will avail multiple benefits from your blog. It will help you drive traffic, market your services or products, share your experience with subscribers, establish reliable web presence, boost your authority, generate leads and encourage your target audience for communication. 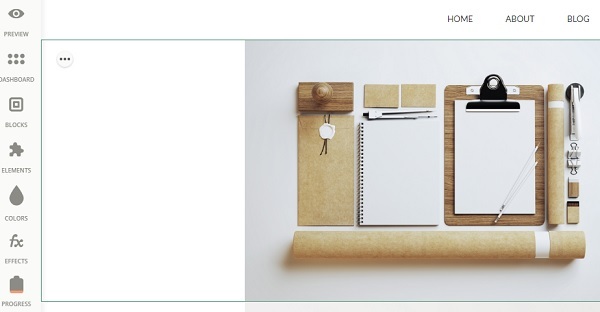 Ucraft offers a rich collection of templates and of them may be used to create landing pages, while the other are good for business websites. All of them, however, look quite appealing, with their flat designs, full-screen formats, high-quality industry-specific content, and other features you will certainly appreciate. In general, the quality of these templates is above the average here. Each theme comes with a description and preview option. It won’t take you long to pick the right template. The variety of themes is somewhat limited, but any template can be customized to suit your specific business needs. Having chosen a template, you will be offered to view a short, but detailed and useful video giving an insight into the system’s basics. Watched it already? Then you are ready to customize your template with the help of a drag-and-drop visual editor. which results in the availability You can choose among a wide range of pre-designed blocks and widgets that can help you develop the structure of your website. Just drag a required element to the pages change its color, position, spacing, size, content, and you will achieve the desired result in no time! 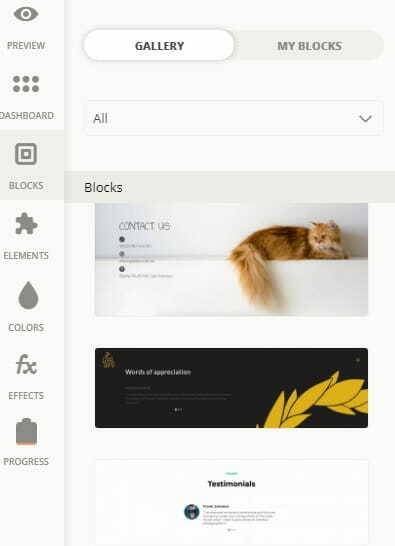 Each block or widget has several settings: background image, opacity, block position (vertical or horizontal), alignment, color etc. Due to these and other features, you will be able to make any template your own to meet your objectives and requirements. 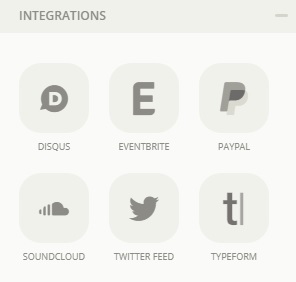 What’s more, you can additionally use the Designer tools section located on the Dashboard. The tool will make it possible to adjust the typography (heading styles, font, size, letter spacing etc. ), use the button and form builder As well as to edit the website’s layout (its width, indentations for desktop and mobile view etc.). Actually, the use of the Designer tools section is not required – Ucraft templates look great as they are, while the default editing tools are well enough to give the website an individual and outstanding look. Another interesting thing about Ucraft is an opportunity to divide sections within a block by colors. This allows for the use of duotone, a fresh trend in website design, when each half of a block comes with its own color, while their proportions and sizes can be changed. Many users may find this feature helpful when developing their websites. To sum up, despite of the limited number of templates, Ucraft looks great from the design perspective. High Quality templates that come with a variety of convenient tools make it possible to achieve a fantastic result. No coding needed. Perfect for newbies. Ucraft support team is available via the live chat in the bottom right corner of the page. It can be accessed even during the trial period. By using the assistance of the tech support service, you will have all your questions answered in the shortest time possible. A Blog section is also available on the home page. The blog abounds in useful articles and recent publications, so we definitely recommend reviewing them before using the website builder. What’s more, you will be able to read the detailed descriptions of each element of the dashboard in the Knowledge Base section. This is where you will find out the essence and tips for each element. All in all, the quality of Ucraft tutorials and tech support is quite high. Ucraft currently offers two options of its using – Free website – a completely free plan, where you can create a single website, edit its content, add custom domain, get free hosting, SEO options, customer support, invite your team members. At the same time, Ucraft watermark will be displayed at your site. This plan works well for landing pages or small projects. The second plan called Pro Website costs $10 /month. Here you receive a possibility to create an unlimited number of your website pages, add up to 50 products, 24/7 chat support, an ability to create a multilingual website. The Ucraft watermark will be removed from your website. The other plans – Pro Shop and BigCommerce – are more about eCommerce using. They start from $21/mo to $39/mo. The key difference is in a number of products to sell (from 50 to unlimited) and some other additional eCommerce features like availability of discounts, more more sales channels, payment options etc. During 14 days after the signup, you will be able to explore the system to its full potential. As soon as the trial period is over, you can continue using the platform for free, but there will be certain restrictions in this case: your website will be unavailable for public, but at the same time all other functions like Dashboard Apps and chat support are live. For those users, who intend to use the system for website builder business setup, Ucraft offers a scalable White Label solution providing multiple advantages. The service allows using its features and tools under your brand name to boost your marketing success and build customer trust. Just take your time to design the templates and sections to be further offered to your customers and get ready to sell websites under your business name. This solution with come in handy to freelancers, entrepreneurs and web design agencies willing to get the most out of their business promotion. There is no need to master complex coding basics or be concerned with system updates that may do harm to your website. Ucraft White label solution is safe, convenient and affordable to everyone. Among the benefits you will avail, when using the tool, you’ll certainly appreciate a simple drag-and-drop editor, integrated Google Cloud hosting, availability of over 15 third-party integrations (Google Maps, Vimeo, Disqus, Mail Chimp, YouTube, SoundCloud, PayPal, Instagram, Twitter, Google Analytics etc. ), domain reseller, understandable and user-friendly admin dashboard, several payment gateways, rest API, dedicated account manager and more. To make use of the White Label tool, you’ll have to choose between a Standard Package ($5600/year) and a Self-Hosted Platform (by quote). The first option works well for designers and web masters and offers the options of using your company brand, creating the unlimited number of websites, your own templates, pricing model etc. The second plan is a decent choice for large web design companies and cloud hosting providers. Apart from the options implied by the Standard Package, it also offers Google Cloud Hosting, affiliate software, RESTful API for Custom Solutions, referral program and other benefits. The only notable drawback is a limited number of templates, but their amount increasing from week to week. The design, however, is easy to customize as per your needs: you can rearrange blocks, add new ones, change industry-specific with that of your own and… eventually get a custom theme! So, this downside is not really substantial for this type of the platform. Ucraft is a stylish, modern, and appealing website builder, which will certainly be of great help to newbies. The platform is also a good solution to create complex and large-scale websites (except forums). This website builder is a nice choice due to the range of features it offers. Creating a nice business website is a piece of cake with this platform. 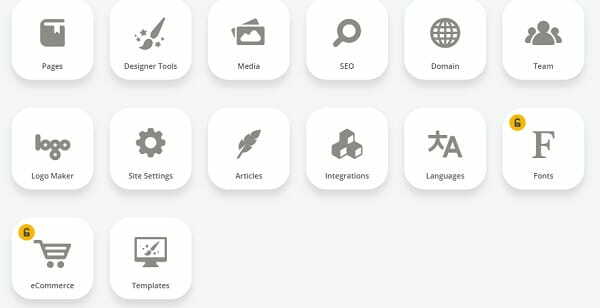 There is everything you might need for the purpose: a rich selection of widgets and drag-and-drop blocks that can be customized with a few clicks, SEO-parameters for further promotion of the website and first-class templates. What’s more, you can test the system for free, although, there still will be specific restrictions. Give it a try, it won’t hurt checking it out. Are you still looking for an affordable and functional website builder? Don’t be, because Ucraft is really worth your attention!